Tomorrow is sunday. Hope it's really going to be a sunny day because... Alex and his flatmates will throw a party. A BBQ party. With 100 people. But that's enough, don't want to bother you with all my weather-ish things again. Yesterday, around midnight, Cologne: Many happy people left the "E-Werk". Happy because they went to a brilliant concert: Less than Jake & Dropkick Murphys. Very, very, very cool thing. Really good music. 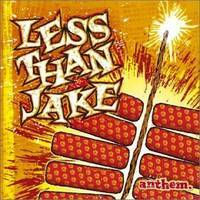 Especially Less than Jake, even though they weren't the actual headliner. And I don't care. Because I hate being fooled by weather. Just one hour ago I was sitting in a park with tasty ice cream in my hand, talking to some friends and having fun. Now I'm at home and it's almost raining. And I have to do my daily shopping. Fun, fun, fun. Reminds me about what friends told me about their last weekend, especially saturday. Just to remind you, I was in Paderborn: It was raining and so cold I had to wear my woolly hat. My friends stayed in Bonn: It was sunny and they had lots of fun barbecueing in t-shirts. I'm not loved by weather. This is why I've created this new blog. Furthermore I just came back from Paderborn, where I visited my old friend Meike. It was quite a funny and eventful weekend, with a usual annoying journey. The Deutsche Bahn is really crap. Not one of my six trains arrived in time. But hey, at least one advantage: They were all late so I could catch them all and didn't have to wait at some exciting stations like Hamm. Hamm is just as funny as it sounds. Paderborn isn't very exciting aswell, but the people that surrounded me were. Had a lot's of fun and didn't get enough sleep. But hey, I don't complain. P.S. : You might wonder why my blog is named like this. If you like: have a guess!